An estimated 49,000 people attended the National Ploughing Championship today. That is described by the organisers as an average opening day crowd, but was still down 20,000 on day one last year. 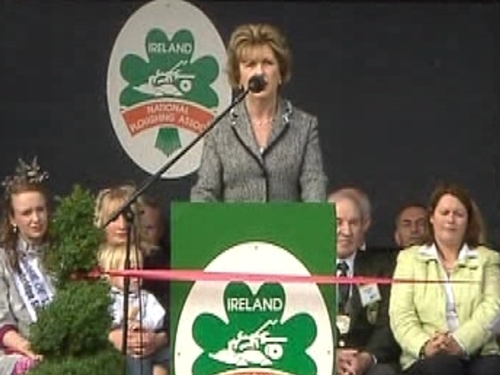 President Mary McAleese officially opened the 2009 National Ploughing Championships at noon. The event is taking place on a 600-acre site at Cardenton near Athy, Co Kildare. The President said the event was taking place at a time when Ireland had taken a step back, but she said Irish people were resilient and Ireland remains a high achieving country. Mrs McAleese said we live in an improving world and people would pull together to move forward. She said the farming community remained at the centre of that change and she said she wished the best to everyone as we move forward to meet the challenges. Mrs McAleese paid tribute to the organisers of the championships and said it continued to be an important event for people living in rural Ireland. About 180,000 spectators are expected at the Co Kildare site over the next three days. A Garda traffic plan is in operation but visitors have been warned of delays and are asked to use public transport where possible. Traffic delays have not been as bad as previous years, according to gardaí and AA Roadwatch. This year's festival is taking place close to where the event was first held 78 years ago. There are over 900 trade stands at the show, in addition to the 300 competitors who will take part in events between now and Thursday evening.